We all produce waste during our day to day lives and when the materials that we consume come to the end of their useful life it is important we make better use of them by reusing or recycling those we can. We all have a shared responsibility to help achieve this..
A Green bin for non recyclable/compostable waste (this is used the generate electricity). All three services operate on a fortnightly collection schedule. Cannock Council would like to thank its residents for helping to reach a fantastic recycling rate of 50%. Thanks to the efforts of its residents the district continues to increase the amount of waste that is recycled and composed instead of been thrown away. This helps to save resources, energy and protect the environment for future generations. When the council first introduced recycling in 2004/5 the recycling rate was at 13.4% and composting rate at 8.1% which meant that 78% of the waste in the district was thrown away. Since 2012 we have alway been above 50% recycling level. 7,944.51 tonnes of garden waste was collected from the brown bin and converted into compost. 19,290.17 tonnes of waste collected in the green bins was disposed of at a energy recovery facility. We are fairly certain that there are more materials that could be recycled that are still been put into the green bin. The yearly history of the districts performance since 2005 is shown below. The Total Recycling includes both the dry recycling (blue bins) and organic/garden (brown bins). The graph below shows the performance of the dry recycling and the organic/garden elements of the our recycling perforenance. We have been asked on a number of occasions how heavy a bin has to be before it is rejected by our crews? Each bin lift on the back of the lorry has its own weight lifting sensors. These sensors are fitted to accept up to the maximum weight that is safe for a standard bin to hold. After speaking to our bin manufacturers, they have advised us that a standard sized 240 litre wheelie bin when empty weighs approx 13kgs. The maximum amount of waste or recyclables it is able to hold is 83kgs and the bin lifts will only lift a bin that weighs no more than 96kgs. If your bin is rejected by the lift for being too heavy, it will be tagged with instructions. We will not be able to empty the bin again until the extra weight is removed. The bin must then be placed out for collection on the next appropriate day. We would ask residents to please understand that we have to follow all health and safety instructions without question, for both the safety of the residents and the crews. Although it may not sometimes seem logical to them, the crews are unable to deviate from the procedure they have been asked to follow. What if I think my blue bin is the wrong size for my household? If you think you need a different sized blue bin due to the number of people in your household you can request an assessment by emailing wasteservices@cannockchasedc.gov.uk or contact us on (01543)462621 . But try your blue bin first for size. We will contact you regarding your assessment at the end of September. Did you know... only a small amount of your council tax goes towards waste collection? There is a higher cost for disposal of all the waste it does not get recycled. 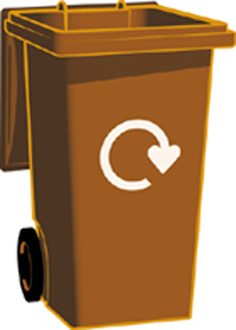 By recycling more we are helping keep our costs down, and avoid a larger portion of your council tac going to pay for disposal of waste you are also helping our environment. Do items need to be cleaned out? Please continue to rinse items out. When sorted these items can be stored for a number of days before being reprocessed, rinsing items out prevents odours. If the wrong items are placed in the blue bin will the contactor still take them? If not, will contractor inform the household why the bin has been left? If a bin contains the wrong items then the bin will not be emptied, the contractor will leave a tag on the bin to explain why the bin has been left. For confirmation on the items the Cannock Chase Council can recycle from the kerbside place refer to information booklet, our website or phone on (01543) 462621. Can I share with my neighbour if space is limited? Where do I leave my bin front or back? Can I use plastic wheelie bin liners in my blue bin? Our contractor has stated that these are not acceptable due to their size which have in the past damaged machinery at the sorting plant and also the potential that customers will tie the bag at the top on collection day and the crews will not be able to check the bin for any visible contaminants. Any bins found to have liners will be tagged with instructions and left until the next collection.